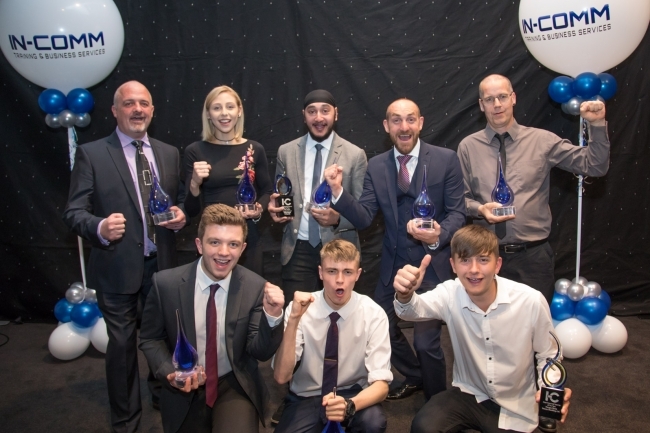 The future stars of engineering, manufacturing and professional services were recognised last week at the annual In-Comm Training Awards. The trainee toolmaker, who will now spend a week Chrion in Germany as part of his prize, impressed judges with his thirst for continuous improvement and how far he has developed over the last twelve months. He was joined on stage by five other apprentices, including FBC Manby Bowdler’s Dixie Whitten, Brandauer’s Oliver Eskriett, Lee Matthews (RMD Kwikform), Morgan Goule (Beacon Mouldings) and Tom Weaver of Frank Dudley Ltd. There was also recognition for Lee Pearson of Salop Design for his ‘Contribution to Engineering’, with Lichfield’s IMI Precision Engineering beating off competition from 20 firms to land the ‘Company of the Year’ title. “Vocational learning is finally being given the recognition it deserves and this year’s awards again highlighted the outstanding talent we are developing in the West Midlands,” explained Rebecca Phillips, joint Managing Director of In-Comm Training. The In-Comm Training Awards, which are now in their sixth year, was backed by main sponsor Engineering Technology Group and other sponsors FBC Manby Bowdler, John Winter, Made in the Midlands, Mason, Moore Stephens, Royal Bank of Scotland and Stechford Mouldings. An industry-led judging panel was responsible for choosing the eventual winners, with the prizes given out by music legend and railway enthusiast Pete Waterman OBE. Gareth Jones, Joint Managing Director, concluded: “The introduction of the Apprenticeship Levy gives employers a great opportunity to shape the training provision they need, creating the skills and future employees they’re going to require to grow and succeed.